Newly elected Republican governor Scott Walker of Wisconsin is attempting to reduce teacher’s benefits in his state and destroy their ability to organize. In his first 50 days in office, Walker gave tax breaks to the wealthy, and is now trying to reduce benefits and take away collective bargaining rights from teachers because the “state is broke. “ In one of the most heartening progressive actions in decades, the teachers of Wisconsin have responded by shutting down the schools and occupying the State House. In its Jan. 31 memo to legislators on the condition of the state’s budget, Wisconsin’s Fiscal Bureau determined that the state will end the year with a balance of $121.4 million. Walker is now claiming there is a $137 million deficit. That deficit exists because Walker and his allies pushed through $140 million in new spending for his cronies and their special-interest groups in January. To resolve the deficit, Walker has proposed a $137 million budget “repair” bill designed to undermine the long-established collective bargaining rights of public employee unions, and pay for his schemes that redirect state tax dollars to wealthy individuals and corporate interests. This story is bigger than Wisconsin. Finally, the beleaguered middle class is saying no to to the relentless plundering of public resources for private gain. They are saying no to banks and corporations, and the Democratic and Republican politicians who do their bidding at the expense of working people. And in the land of unions where the state motto is “forward Wisconsin” the citizens have begun to take back the country for working and middle class Americans. The governor and his Republican controlled Senate and Assembly had planned to ram though his draconian “budget repair” bill that would punish teachers, destroy public sector collective bargaining, and cut state health care funding for the poor. The senate needed one Democrat to form a quorum, but fourteen brave Democratic senators have fled to Illinois to prevent the vote on the bill. They are still there as of this writing. 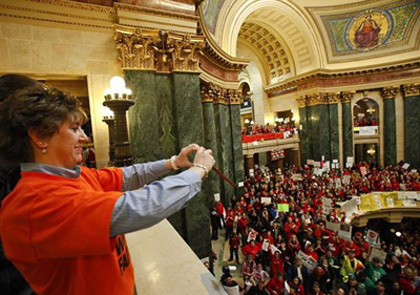 As of Saturday, February 19, there were up to 70,000 teachers and supporters in Madison demonstrating against the bill. Walker, whose campaign was funded heavily by the Koch brothers who are known for their antipathy toward public sector unions, has decided to do their bidding in Wisconsin. But the Koch brothers found a like-minded candidate in Walker, who had long fought unions in his previous job as Milwaukee County executive. A right wing extremist, he once suggested privatizing the entire government. What Walker is doing is happening all over the country in Republican controlled states. Republican governors and their Republican controlled state assemblies are busy union busting. In the post Citizens United era, unions are the only institutional donors that can somewhat compete against the flood of corporate money that will go to Republicans in 2012. So, Republicans will spend the next two years in an all-out assault on public and private unions. If they have their way, union membership will plummet and unions will lose their financial base and their ability to stem the flood of corporate money in 2012. What is happening in Wisconsin is clear, focused progressive grassroots action, something that has been missing on the Left for decades. Not only are the teachers and their supporters demonstrating, they are considering recalling eight Republican senators immediately and Governor Walker next January. Even if they fail and the bill passes, the teachers, with union and other progressive support , will pursue the recalls. All of these actions build political muscle and will inspire others around the country to fight back against the political policies and corporate forces that are gutting the middle class and devastating the working poor. The teachers have received tremendous support from around the country and around the world. Some have traveled from other states to join the them in Madison. Others who live outside the state have ordered pizzas to be delivered to the demonstrators. (So far Ian’s Pizza on State Street has taken donation orders from over half the states in the Union plus the countries of Egypt, Denmark, Canada, Germany, China, England, Netherlands and Turkey.) 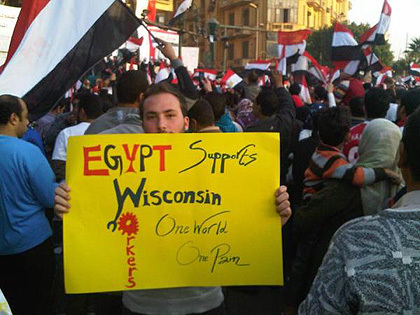 Even people in Egypt are aware of what is going on in Wisconsin and have shown their solidarity. It is thrilling, and fitting, that a progressive state that gave us the eight-hour workday and five-day workweek, is at the epicenter of this fight—a national fight to restore and strengthen the middle class. Next Post:Can a movement tolerate ambiguity?